I have another Easter card to share today that makes use of some pretty punched borders a blogging friend sent to me a long time ago. I don't know who makes them, but they're perfect for Easter with the bunnies and word "hop." I added some tall and regular grass done with SNSS dies, and added a Lil Inker stitched bunny die, along with a SB die cut sentiment panel. The background was embossed with a CB swiss dots ef. Have a fantastic weekend and thanks for stopping by! A super Easter card Carol, a cute bunny and lovely punched borders. A perfect, perfect, card for Easter! I LOVE that little bunny and the flower border is so cute. LOVE IT! 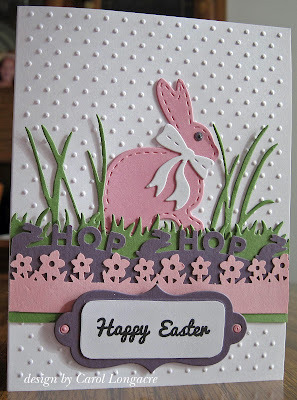 This is such a pretty Easter and spring time card. Love those punches and dies. Another winner on your part, my friend. Enjoy the rest of the weekend. Oh, yes....I love that bunny border and can't remember if I ever used it or not. Your big bunny and the card is so adorable for Easter. Love the tall grasses. Oh, lovely Easter card, my friend! These punched borders are really fabulous, perfect for this season! Love so much the cute bunny, the grass and the dotted embossing! A lovely card for Easter time. 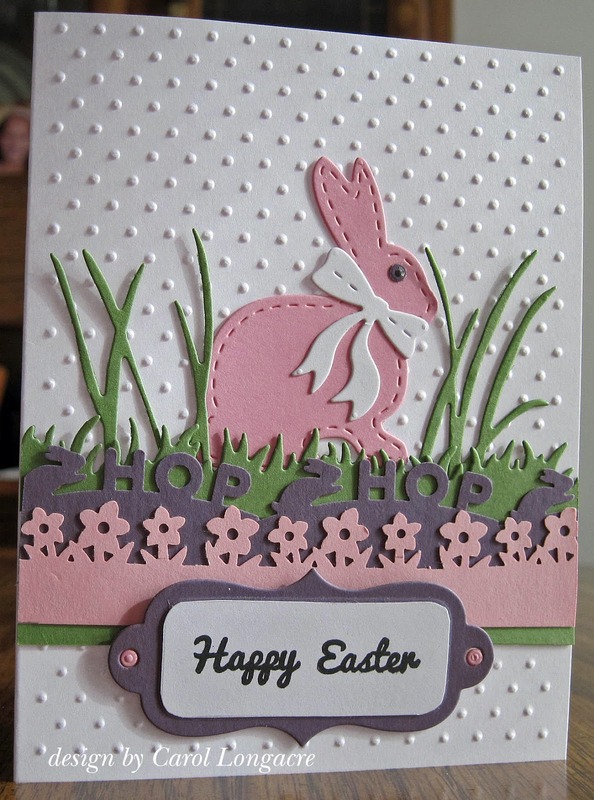 Great use of the lovely die cuts, and I love the cute pink bunny. What a darling springtime card. I love all those punched borders combined together. They are by Martha Stewart. Oh my goodness.... I do believe I am in love! That hop hop border is perfection, as is the whole card! Wow, this is such a sweet card. I really like your pink bunny with the tall grass and cute border cuts. Thank you for playing along with DRS Designs this week!